Website builders like Squarespace make it easy to create a beautiful website -- even if you don’t know how to code. 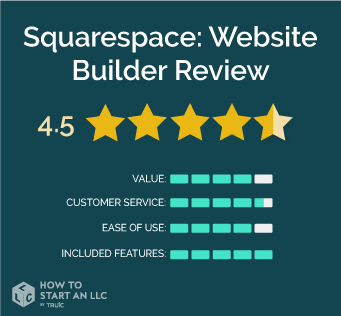 In this review, we’ll go over the details of Squarespace’s web-building platform and explain how it compares to other website builders on the market. Read on to find out if Squarespace is the right choice for you. Squarespace is a user-friendly, image-forward website builder with a wide range of offerings. From personal bloggers to eCommerce businesses, almost anyone can find a Squarespace package that suits their needs. Squarespace is all about breadth, not depth -- unlike Shopify or Wordpress, Squarespace doesn’t specialize in any one particular type of website. Instead, they offer competitive features and functionality across the board. Who is Squarespace right for? Squarespace is known for their massive library of intuitively designed, mobile-optimized themes. The Squarespace team is great about fixing bugs and optimizing on-site features. The customer support staff are super responsive and thorough. Their platform allows for more customization than any other website builder on the market, enabling users to personalize everything from image opacity to overall page layout. Squarespace is slightly more expensive than some of their competitors. Depending on the size and scale of your website/eCommerce store, Squarespace may not offer the fastest website speed. While Weebly’s eCommerce features are not as deep as Squarespace, it is great for those in need of a personal website with a simple store. Squarespace offers four web-building plans divided into two categories, Websites, which can be more for personal use using the basic Squarespace website builder or get a taste of the full features of Squarespace, allowing for the use of custom code, eCommerce stores, and other marketing-oriented features. The Online Store packages are for entrepreneurs and small businesses looking for a deeper eCommerce experience, with more commerce metrics, integrations with accounting packages, and no transaction fees taken by Squarespace. Who should purchase the Personal plan? The Personal plan is a good choice for individuals in need of the power of the Squarespace platform for an informational, portfolio, or other types of non-eCommerce website. It's important to keep in mind that a free domain name is also given when purchasing this plan annually. Who should purchase the Business plan? Who should purchase the Basic Online Store plan? This plan is best for growing online stores that have a higher amount of transactions, and most importantly is the first plan that comes with no transaction fee charged by Squarespace, which is 3% on the Business plan. This, with the more advanced metrics, and integrations with accounting platforms like Xero make this package a good set up to start selling more seriously. 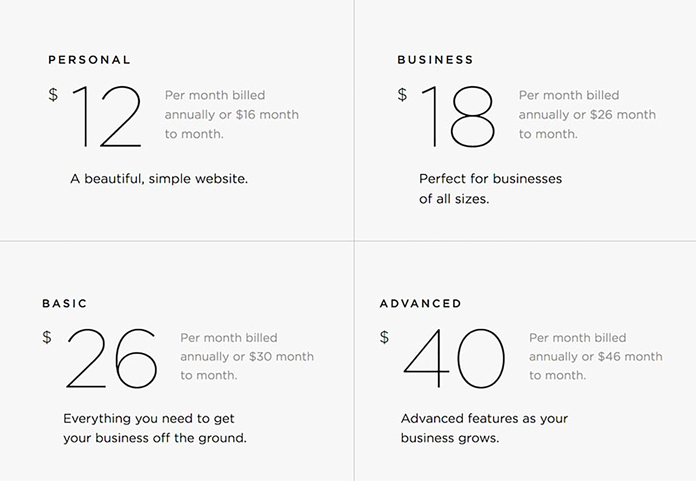 Finally, Squarespace's most advanced plan adds some more advanced eCommerce features for serious online sellers and costs $40/month (if paid annually). Who should purchase this Advanced Online Store plan? This plan is best for stores that deal with a high volume of sales, and want revenue optimizing tools like abandoned cart recovery to recapture potentially lost sales, shipment tracking features to share with customers, gift cards and even more advanced programming options to connect your developers with Squarespace's system. The value a user sees in Squarespace is largely dependent on their personal tech needs and preferences. Many folks love the fact that Squarespace offers live in-line editing tools and incredible customization capabilities. However, other users prefer the simple drag-and-drop design system utilized by website builders like Weebly -- especially since it tends to come with a lower price tag. The trade-off for Squarespace’s advanced level of customization is a fairly steep learning curve. Of course, the learning curve is worth it if you plan on taking advantage of all the customization capabilities -- otherwise, you’d probably be better off using a cheaper, more simplistic web-building platform. Squarespace provides plenty of customer support resources, including live chat and 24/7 email assistance. In addition to these, they also have a ton of guides and videos on-site that are actually helpful. The one knock against Squarespace’s customer support is the absence of a customer service phone number, but aside from that it really couldn’t get any better. Again, Squarespace’s user-friendliness varies a lot depending on personal preference. Many folks consider Squarespace to be super intuitive and easy to use -- no coding is required, and their templates make it easy to plug in and arrange content. Still, the platform is slightly more sophisticated than some other website builders (like Wix and Weebly). We’re docking a point here simply because of the learning curve Squarespace imposes on some users -- but in the end, the appeal of a premium website builder like Squarespace is its versatility. If you’re leaning toward using Squarespace, we recommend taking advantage of their free trial in order to familiarize yourself with the platform’s layout, explore their “Help” section, and play with the various tools they include in a subscription. Squarespace provides a truly impressive collection of tools. While other website builders tend to specialize in one particular area, no other provides as wide a body of high-functioning capabilities as Squarespace. For example, you could host an iTunes-synced podcast, a blog with features on-par with Wordpress, and an online store with unlimited product postings -- all on the same website. They also offer unlimited storage and bandwidth, HTML capabilities, and more on-site SEO customization than any other website builder. You can even password protect your Squarespace site, or particular pages if needed. Basically, everything on Squarespace is customizable. All their apps and tools are designed in-house, so troubleshooting is super straightforward. It’s easy to award Squarespace full points in this category! Squarespace is a premium web-building platform that’s only getting better over time. If you’re looking for a sophisticated website builder with tons of customization capabilities, Squarespace could be right for you. With Squarespace, you’ll be able to provide your customers with a truly top-notch user experience without having to hire a professional web developer. Furthermore, Squarespace has all the intangible qualities of a reliable company. Over the years, they have worked to address their problem areas, and are constantly adding features and resources to make their platform better. We highly recommend taking advantage of their free 14-day trial to find out whether or not their platform is a good fit for you!